Dr. Vladimir Gashinsky is 1 of only 5 dentists in New Jersey and a Premier Provider with extensive experience in placing zirconia implants. Well over 100 million Americans suffer some form tooth loss, and today zirconia dental implants represent the most aesthetic option available for tooth replacement. Zirconia implants are comfortable for our patients, and due to their all-white color they present the most natural looking results. 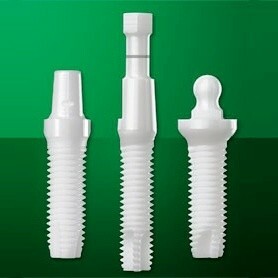 Most importantly, zirconia dental implants perform just like natural teeth. When teeth are removed or lost due to trauma or infection the underlying bone is no longer used, resulting in a weakened jaw and bone loss. This makes it difficult to smile, chew and do other things most of us take for granted. Furthermore teeth next to the lost tooth/teeth shift and and the opposing one(s) drift into the spaces left by missing teeth. These ultimately lead to malocclusion, jaw collapse, jaw muscle pain and even chronic headaches. Dental implants provide the same function as the natural tooth root which they replace, including stimulating the bone in the most natural way possible and maintaining adjacent and opposing teeth in their place. Zirconia dental implants prevent bone deterioration and improve a patient’s ability to chew food normally. Dental implants can last a lifetime and are placed directly into the bone where the teeth are missing. They do not adversely affect the adjacent healthy teeth. Implants bond to the jawbone and become part of it – making a connection as strong as a natural tooth root. Provide stability without the need for messy adhesives. Whether you’re concerned about metals in your mouth or prefer to have natural looking teeth, zirconia dental implants provide the best alternative to titanium dental implants. Titanium is a metal, and suffers corrosion. Corrosion, the gradual degradation of materials by electrochemical attack, is a concern particularly when a metallic implant is placed in the hostile electrolytic environment provided by the human body. The clinical importance of degradation of metal implants is evidenced by corrosion and wear in the tissue surrounding the implant, which may ultimately lead to bone loss. Zirconia is a ceramic and does not suffer any corrosion. Throughout the decades, the materials that have been used for the dental treatments have been made with metal. The main reason was to give mechanical strength and therefore augment the longevity of the treatment. Over time, the scientific research contributed enormously to the improvement of the ceramic’s mechanical strength. In the beginning, ceramics were introduced into the patients mouth because of its aesthetic properties. However, the latest research shows that the aesthetic is not the most important characteristic of this material. Ceramics, due to their inert, non-corrosive and nonallergic properties, are actually many times more beneficial to the patient than any other dental material ever made. Titanium allergy is barely recognized in mainstream medicine – yet laboratories have reported that about 4% of all patients tested to titanium will be allergic to it. For those affected with titanium allergy, the symptoms can range from simple skin rashes to muscle pain and fatigue. From foodstuff to medicine, titanium is now an everyday metal. Several brands of candy, such as Skittles and M&M, have titanium dioxide in the coating – often described by its E-number: E171. Some brands of toothpaste contain titanium particles. Hospitals use titanium implants to rebuild bones after accidents. Like all metals, titanium releases particles through corrosion. These metals become ions in the body and bind to body proteins. For those who react, the body will try to attack this structure. This starts a chain reaction which can lead to many symptoms including Chronic Fatigue Syndrome. Zirconia implants don’t have these problems. They are safe and friendly for the body, and do not create adverse effects on your mouth and health. As an expert in holistic dentistry and a Premier Zirconia Provider, Dr. G recommends zirconia implants to not just deal with dental problems, but to safeguard your overall health. For questions of a free consultation, call (973) 739 9080.